Remember when you moved out, and your mom threw away all your cards, without even asking you? It was probably a terrible feeling when you finally got the news that your cardboard treasures had been disposed of, like they were a pile or trash. This actually happened so often, that Topps produced a set in 2010 called "The Cards Your Mom Threw Out" - to give collectors a chance to see those cards again. Imagine having the foresight to tell your mom (or dad) not to throw them away, but rather to save them because they could be worth money someday. This happens to be one of those feel-good stories, where those childhood memories were saved, and have now been turned into cash. Forty years ago, a father was cleaning out the house when he came across some old cards that he had collected as a kid. Being that he hadn’t seen them in years and had no interest in them, he was going to throw them out. Before he was able to, his son convinced him not to throw them out, and that he would hold on to them because they might be worth something when he was older. The son then took the cards from his father, but them into a shoebox, and protected them with cardboard and plastic so they wouldn’t get ruined. He stored them away in a closet and hasn't seen them since. Well, that was until last week, when the son found that old shoe box full of cards, and decided to contact us. He was unsure if the cards were even worth anything, so he called on our expertise for an appraisal. 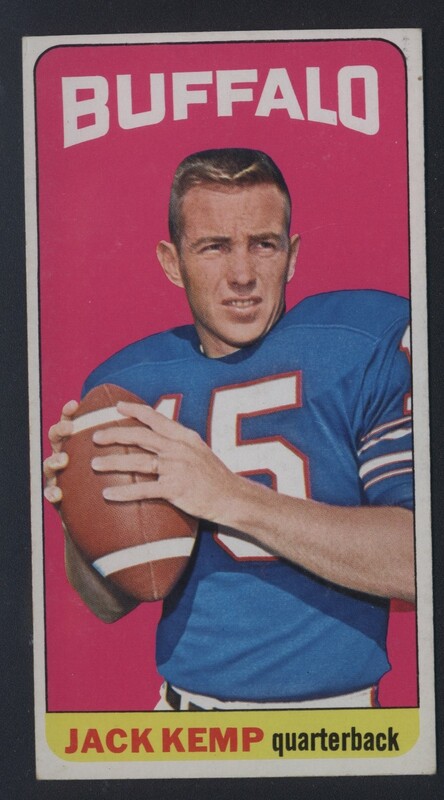 Lo and behold, mixed in with the stack of the hundred or so 1965 Topps Football cards, was a Joe Namath rookie card! The card is definitely not pristine, but still holds some value in it’s “collector grade”. The son (now the seller) made a wise choice in convincing his father not to throw away these cards, and contacting us to see if they had any value. The rest of the collection was nothing to get too excited about, as it consisted of a bunch of low to mid-grade commons. 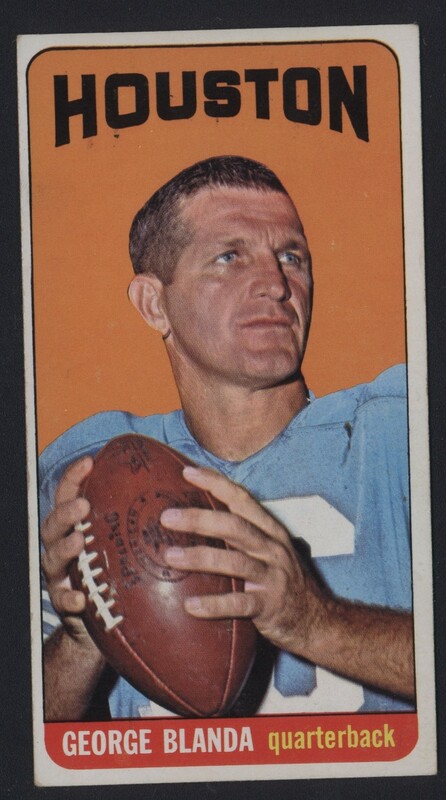 It did however, have two other bright spots, which were the Jack Kemp & George Blanda examples. Those cards were in VG/EX to EX condition, same as the Namath. There were also a few one-offs in the collection, like a 1972 OJ Simpson and a 1963 Bratkowski. 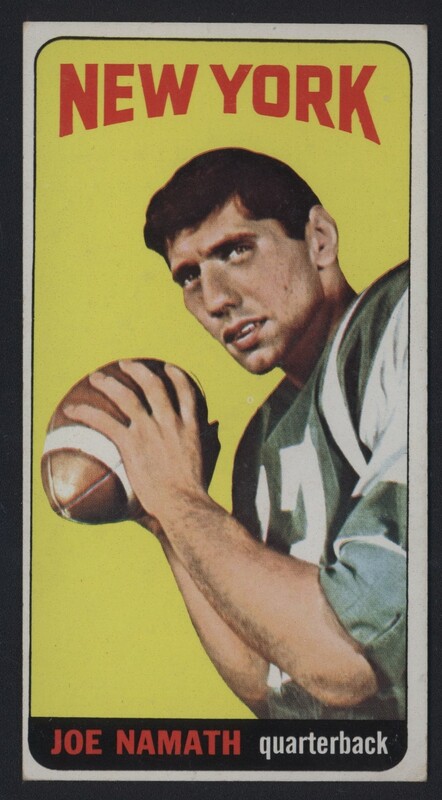 The bulk of the value however, comes from the Namath rookie. The value of Broadway Joe’s rookie card has exploded over the last year or so. For a very long time, we saw PSA 8 examples fluctuate between four and six thousand dollars. It wasn’t until late 2014 till we saw the first PSA 8 example eclipse the ten thousand dollar mark. Same holds true for mid-grade examples. Just a few short years ago, PSA 5 EX examples were selling for between $500 and $700. Now, they are selling for nearly double that, with the most recent sale hitting $1,201.00 last week. Vintage rookie cards are on the rise, and we’re happy to be a part of the hobby during this exciting time. Let us know which rookie cards are in your collection, and if you are looking to sell!